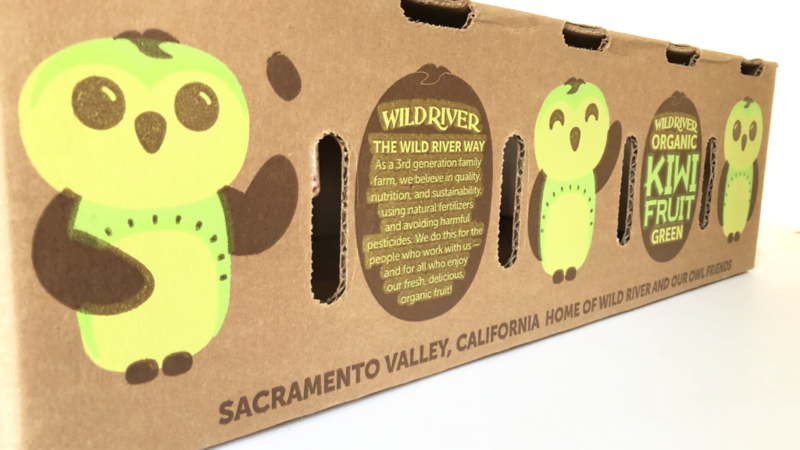 Located in Marysville in California’s Sacramento Valley, Wild River is a third-generation family farm that has deeply invested in organic agriculture. The company considers the flood cycles of the nearby Yuba River as part of its operations. It employs integrated pest management practices and uses natural fertilizers wherever possible to safeguard its workers and its fruit from harmful pesticides. Visiting the Wild River property and meeting members of its family, one comes away with a sense of personal pride and duty. 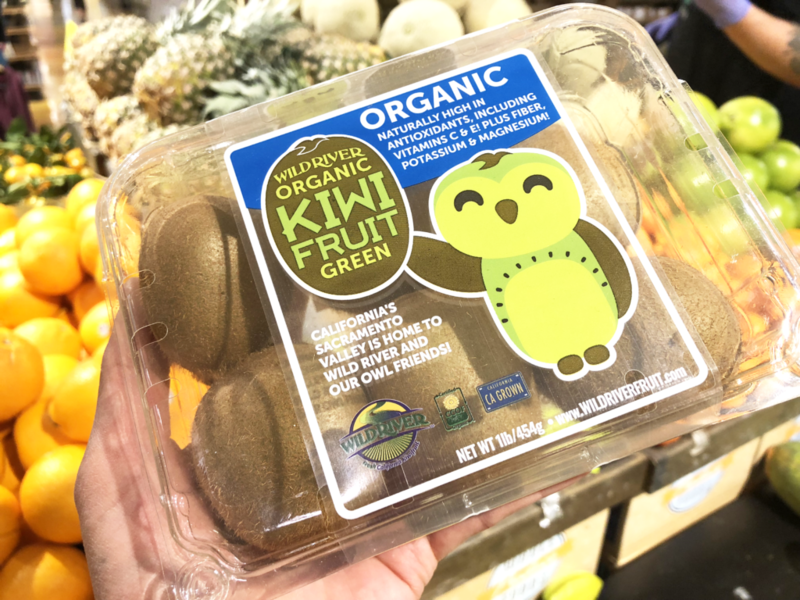 And this pride is especially evident when the family talks of its marquee product — organic kiwifruit. 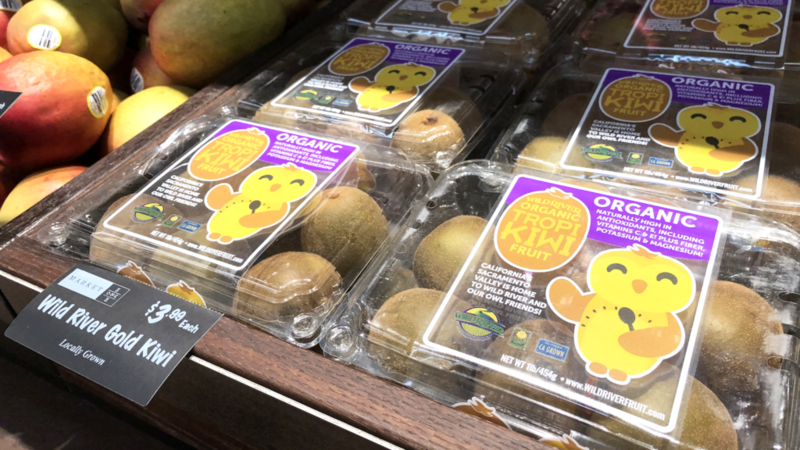 The kiwifruit market in the United States is dominated by conventionally grown fruit — with some brands sporting haphazardly designed cartoon mascots in an attempt to attract retail shoppers with kids. Wild River needed to stand out from these goliath operations. 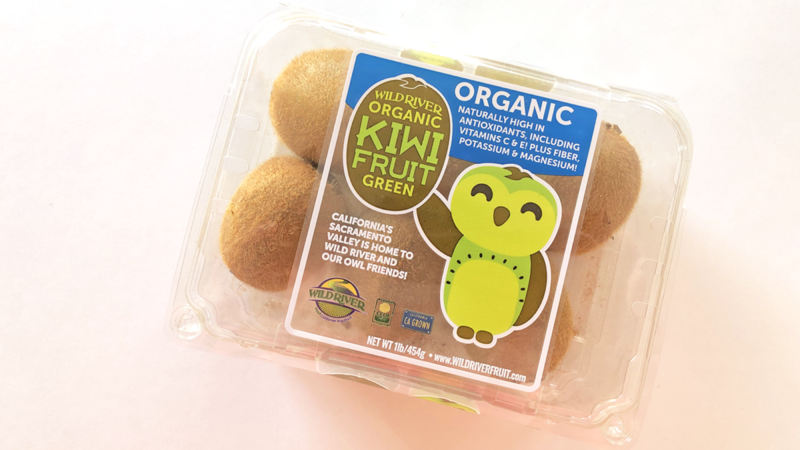 It needed a new strategy to communicate the appeal of its organic kiwifruit varieties, its firm family roots, and its belief in environmental responsibility. The timing comes as the “farm-to-fork” ethos for locally and regionally grown produce continues to gain favor around the U.S. and especially in the Sacramento region. Most importantly, this new brand must capture the heart of that grocery aisle shopper. It must give them a reason to pause and smile for a moment — an invitation to take another step and discover the Wild River story. This project was another fantastic chance to collaborate with my talented friend and colleague Guy Rogers of Spark Creative Design. Guy and I found the inspiration for our mascot fairly quickly. 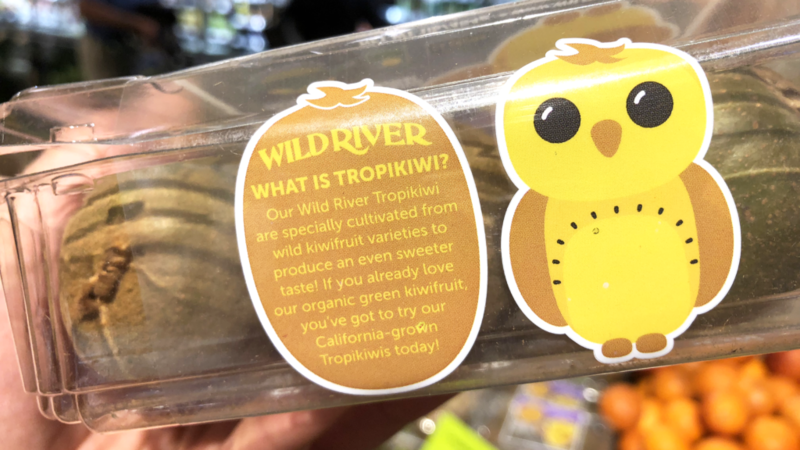 As Wild River president Mike Noland and his son Travis Noland drove us around to tour their kiwifruit vineyards, the answer to our design question literally stood out before us — in the form of wooden owl boxes perched upon tall posts around the property. Barn owls — white, tawny raptors found nearly worldwide — have long been recognized for their pest-control benefits to farmers. On the Wild River ranch, owl boxes have been erected to encourage wild barn owls to nest on the property. That these owls served as natural predators to gophers and other vineyard pests was the hook we needed to tell the Wild River story — and with that, “Our Owl Friends” were born. Wild owls live on our Wild River organic farm in special owl-box homes we build for them! 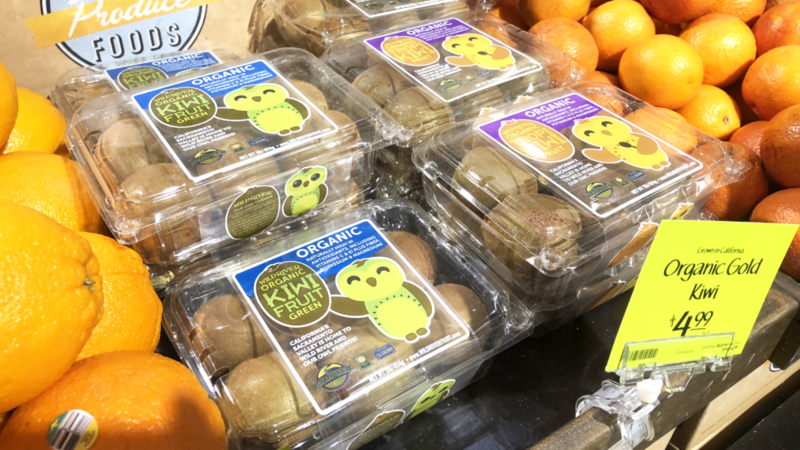 They help keep pesky pests away — just one of many ways we work with Mother Nature to bring fresh, delicious kiwifruit to your family! As a third-generation family farm, we believe in quality, nutrition, and sustainability, using natural fertilizers and avoiding harmful pesticides. We do this for the people who work with us — and for all who enjoy our fresh, delicious organic fruit! 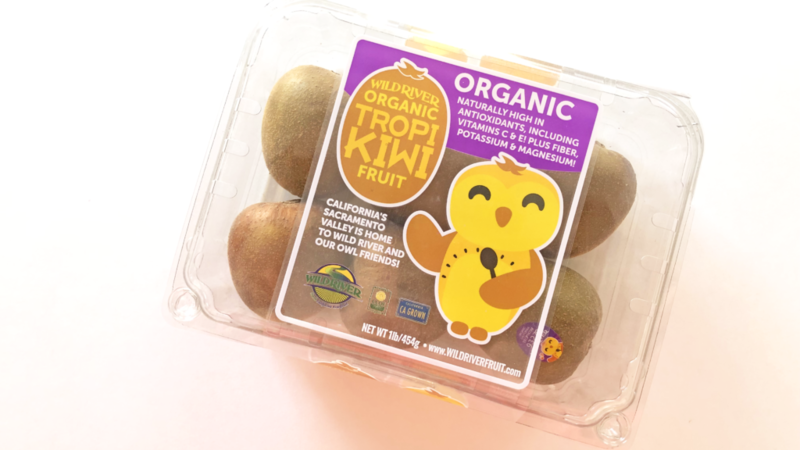 Ultimately, we fledged two kiwi owl characters, one for the standard green Hayward kiwifruit variety, and one for Wild River’s Tropikiwi™ gold variety. Both took on the rounded, hornless faces of real-life barn owls — but with green or gold bellies spotted in the pattern of kiwifruit seeds, and their chic hair-dos matching the calyx of the fruit. 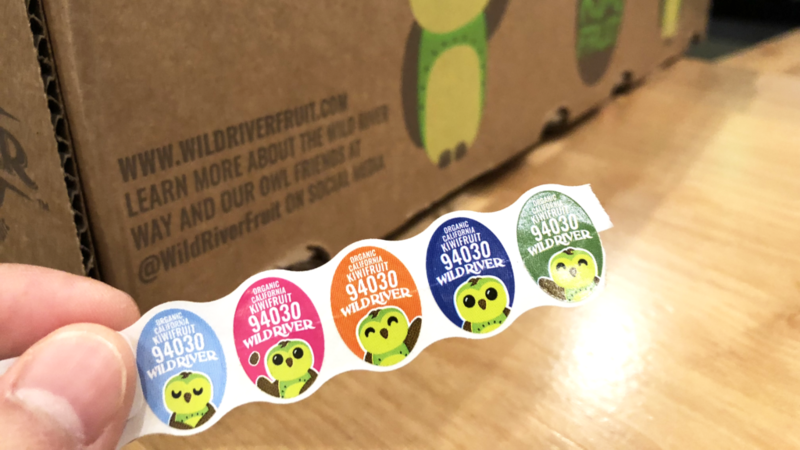 With much credit to Guy’s masterful hand, we further designed a suite of packaging art for Wild River — labels for consumer clamshell packages, Euro cartons and volume-fill cartons for wholesaler handling, price look-up (PLU) code stickers, and more. 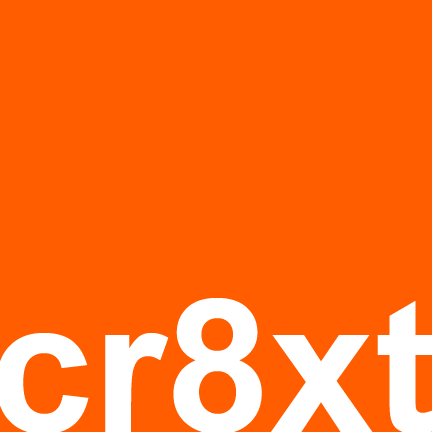 We also produced a graphics kit for web and social media use. 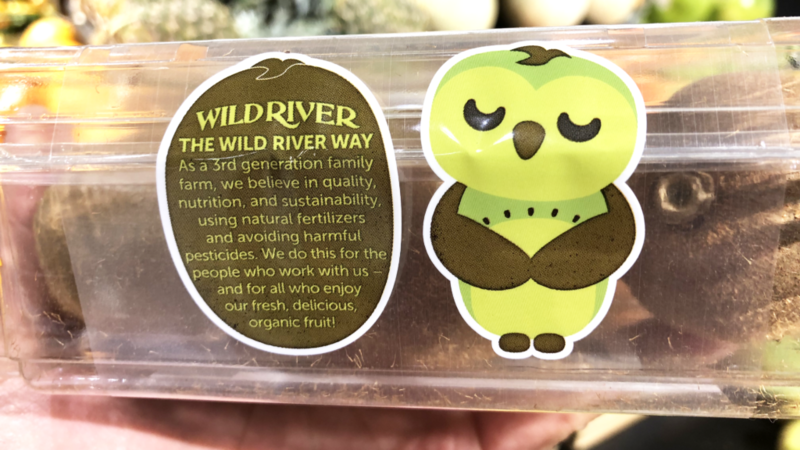 Since their debut in autumn 2018, Our Owl Friends have been sighted from coast to coast, shining new light on this California family company. 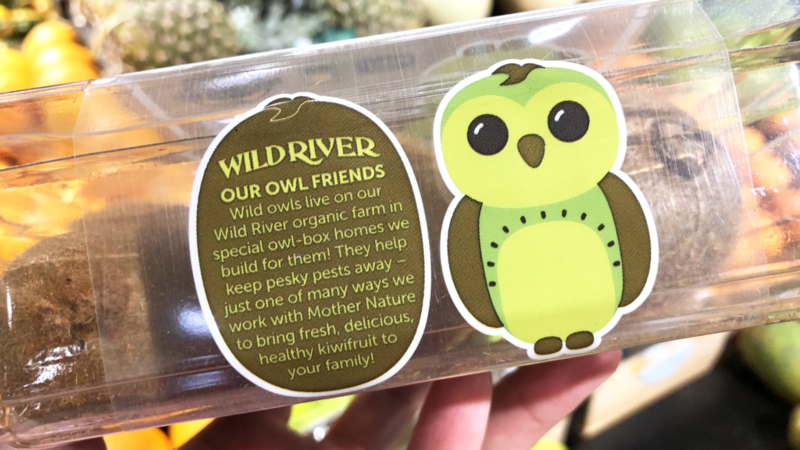 They have a brought a smile to our faces, knowing that our feathered ambassadors aren’t just a cute face — but that in grocery aisles around the country, shoppers are exclaiming, “Ah, so that’s why it’s a kiwi owl!” as they read our packaging copy. It’s been a true joy to work on this project. 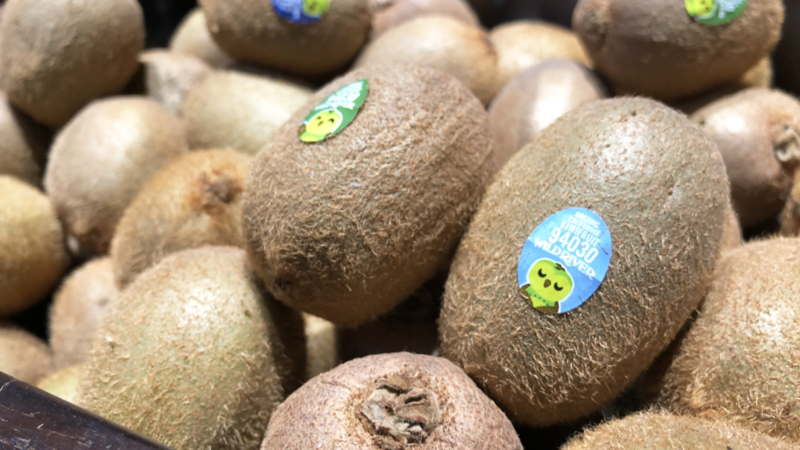 Wild River’s fresh organic kiwifruit from the autumn 2018 harvest will be available in market through spring 2019. 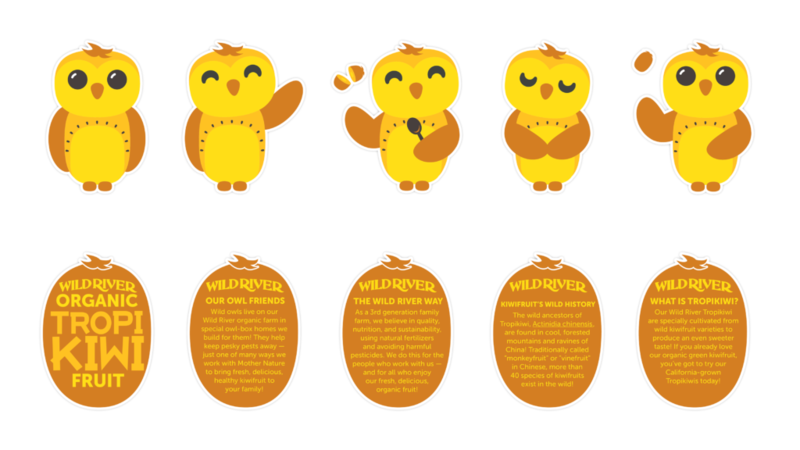 Look for Our Owl Friends in select Whole Foods and Walmart stores around the United States. Within the Sacramento region, look for them in Nugget Markets and at Raley’s Market 5-ONE-5. Follow Wild River (@WildRiverFruit) on Instagram, Facebook, and Twitter. 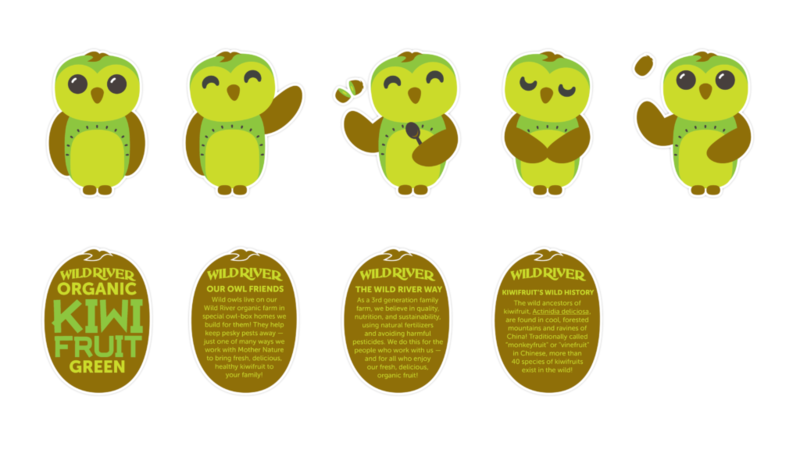 Read coverage of the Wild River rebrand by the Organic Produce Network (www.organicproducenetwork.com). Client: Wild River Marketing, Inc.